Last year marked the longest season for ice skating in the park yet. Citi Pond and Celsius were able to stay open through the end of February after Fashion Week found a new home at Lincoln Center. And this year we've created a food court on the Fountain Terrace by inviting ten of our favorite vendors from The Holiday Shops to remain open through February 26 as well. You'll find some vendors in the same locations: Crepe Cafe, Aroma, Pickle Me Pete and Kettle Corn NYC, but others have moved from around the park, including TopArepa, Vegetarian Oasis, Big Apple Cider, Wafels & Dinges and Mmm... Enfes. We've also added Down on the Farm into the mix to help you stay toasty warm, while you spend more time outside tasting and skating. You're in for a tasty winter! Click image above to view PDF Brochure. 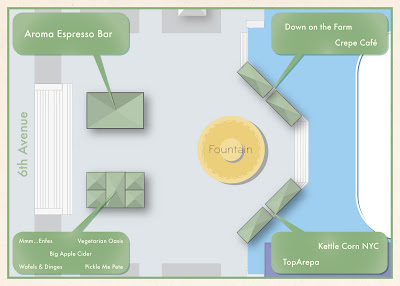 The idea of creating a food court in the fountain terrace is a good one and would arouse the interests of the invitees to participate without fail.